Upon much reflection and with a heavy heart, I have decided to retire from coaching at the end of this season. It has been an extremely difficult decision for me, but I am satisfied that the time is right for me to make this change in my life. Juggling my full-time business, coaching, my other hobbies, and the increased needs of my extended family, has become quite challenging. Those of you who know me well know I don’t do anything less than %100. So something had to give. I began at the Blues 15 years ago this spring. At that time I was approached on a field while coaching an AYSO All-Star team by two interesting characters (Tad and Larry). They asked if I would be interested in coaching for the Southern California Blues. I recall Tad, being the honest person he is, saying at that time, “We don’t know if it will work out. I just want to be honest with you”. They had no idea at the time who they were dealing with. So many memories, so many kids, and so many characters in this crazy youth soccer environment. I will miss it all. What a wonderful life experience. The toothless kids I started with are now beautiful, educated, successful, young women. Watching them grow into these amazing human beings has been, by far, the highlight of this journey. Championships fade, trophies tarnish, but the kids, teens, and young women who’ve passed through The Ranch. Wow! That’s what I’ll take with me forever. Thanks for the great years. Young ladies, thank you for enriching my life in ways you will never understand until you work with, or have children yourselves. Parents, thank you for entrusting your children to me. I think it’s the ultimate compliment for someone to put their children in your hands. Knowing that I had a small piece of their development as human beings is such a wonderful gift. Blues Coaches, you are all my wacky brothers and I have no idea who will keep you all in line, and feed you now. Tad and Larry, I just can’t thank you enough about the opportunity you gave me 15 years ago – I had no idea how much it would impact my life. I absolutely love my Blues family and will miss you all terribly. Over the August 5-7 weekend the U10 Naimie team invaded the Bay Area and they did a lot more than visit Fisherman’s Warf. We seriously doubt they even got to San Francisco although we can’t speak for the parents. In the semis after some questionable scheduling confusion it was determined Mary’s girls would play against El Dorado; the team they had lost to last year in the Mustang Final. El Dorado went on the all out attack but the girls survived playing amazing defense until Jordyn Gather hit the net with a top corner shot from the left side; 1-0 Blues onto the final vs Elk Grove FC. In the final vs Elk Grove Kendyll Fritts opened the scoring for the Blues with a low angle shot that deflected off the opposing keeper before Kendall Carter followed up the rebound and smashed it into the net. From then on it was another outstanding defensive game from all. Rachel Bastone was key in the back line and both goalkeepers (Sarah Javorsky and Ryan Campbell) were in great form. Congratulations girls, hope it was fun! 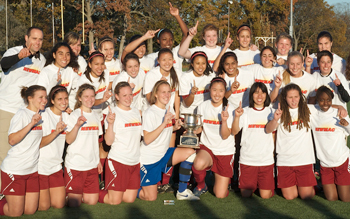 Two Blues Alumni: freshman Elena Gianotas (second from left) and junior captain Andrea Park (fourth from right), both defenders, started every game of the New England Women's and Men's Athletic Conference Championship Tournament this past week and helped bring the Massachusetts Institute of Technology Soccer Team the 2011 Conference Championship and an NCAA DIII Tournament Selection. Andrea who also was an integral member of a Blues U14 National Championship team has helped lead the MIT team to two titles in three years -- the first titles in 20 years. She is also a two-time All-Conference selection. Keep representing Andrea and Elena! (L to R) Gracie Burns, Hailey Clark, Madelyn Elo, Joslyn Elam, Hailey Burgett, Sabrina Javorsky (goalie), Katelyn Rix, Annie Larson, Sophia Pearlman, Paige Brakke, Ella Giannola, coach Otto behind team. (Above) Members of the U10 Kale girls high five one another as they come back to the pack after cashing in one of their pressure packed penalty kicks at the finals of the Oaks Polo Classic. (Above) U9 Otto goes on to defeat Blades in the finals of the Oaks Polo Classic in PK's after loosing to them in pool play. It was a hard fought battle that went into PK's after a 0-0 score. The girls level of play was admirable in the 90 plus degree heat and goalie Sabrina was amazing with 4 saves and a PK herself. 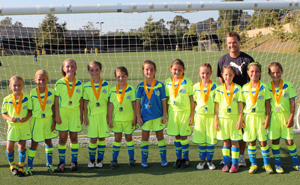 U10 Kale recently participated in the Oaks Classic Tournament at Jserra July 30/31. This is their 2nd tournament championship of the summer ; HB Sand Tournament Champions, Oaks Classic Champions and Wolfpack Tournament Finalist. Girls are playing well and having a successful summer. Congratulations on winning PK's 3-1 in the Oaks Classic Final. For the first time ever the So Cal Blues sent a representative to the Schwan's USA Cup presented by PUMA to participate in the vElite Division. Our Blues U16 Draluck going U17 will traveled to Minneapolis Minnesota to take on the competition including international teams from Sweden and Canada. The tournament is held at the legendary National Sports Center in Blaine, Minnesota;certified by the Guinness Book of Records as the largest soccer complex on earth. The girls were hosted by PUMA and stayed together in door rooms which was great for team bonding. Food was also provided for them at the college dorms. Ha ha the girls had to used to cafeteria food. The girls made it to the finals but lost in overtime to Lamorinda in 110º heat after coming back from a 2-0 deficit in the second half on a last second goal by Kelly Fitzgerald (Stanford). We hope to go back next season with other Blues teams if there is interest. Lauren Benner decided to combine two of her passions—soccer and volunteering—and the winning combination has caught the eye of Nike. Benner, 17, a junior at Aliso Niguel High School with a 4.3 GPA, has been playing club soccer for 10 years for such teams as the SC Blues, which has won state, regional and national championships. 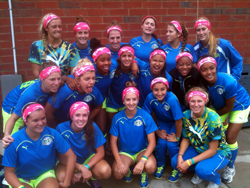 Nearly all of her teammates are destined for top schools, many with full scholarships. She wants to attend school on the East Coast and, hopefully, work for the CIA. In the meantime, Benner decided to meld her love of the game and giving back last year when she started a small charity to support an orphanage in Tijuana called cleatsforacause.org. 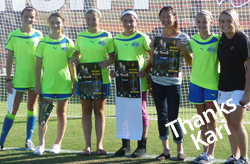 She reached out to soccer clubs and schools for old soccer and other sports equipment. The items collected are driven to the orphanage, Lily of the Valley, where the kids benefit from the items. But things came to a standstill, and she had to think fast. "After draining the local sports economy for used equipment, she went bold last month and lobbied executives at Nike, Adidas, and Puma," said her father, Tim Benner. But a few weeks ago, Nike sent her $5,000 in new soccer equipment—stuff that has not yet hit the stores. "This was a real shot in the arm for her efforts. We have not made the trip down, but we plan to within the next few weeks to give the items to the kids in the orphanage," he said. The young Benner this week is finishing up her school year, which includes four AP classes and first-string orchestra. She also works at the Ocean Institute as a science intern. Needless to say, she's busy. To read the interview with Lauren go to the Laguna Niguel Patch and scroll down to the Q and A. The 3rd Annual SC Blues Golf Tournament was held on October 17th 2011. This year’s event was hosted at Aliso Viejo Country Club. In the past three years this event has raised more than $50,000 to support various programs within the soccer club. The proceeds from this year’s event will help support the SC Blues College Advisor Program (CAP). More than 70 golfers (and non-golfers) enjoyed a great day of golf and most of all fun, which was followed up by the evening’s events which included a helicopter ball drop, dinner, silent auction, raffles, and awards. This year’s ball drop winner was the Haughton family from the Draluck U-13 Team. 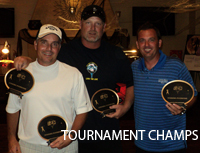 The winning foursome was (Stephan Ward, Drew Haughton, Billy Joe Hobert, and Randy Dodge). The SC Blues Golf Committee would like to thank all of the families, coaches, sponsors, and volunteers for your support and helping us make this such a fun event. Congratulations go out to Blues U17 Dido for clinching the Region IV Championship. 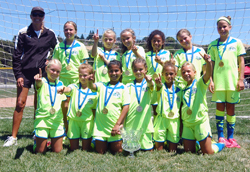 The team punched a ticket to the 2011 US Youth Soccer National Championships which was played July 27-31 at Reach 11 Sports Complex in Phoenix, Arizona. Unfortunately the team was unable to capture the championship but no doubt the experience of participating in a tournament like this will be with these players for a long time to come. Way to go girls we are proud of you. Now in its 31st year, the San Diego Surf Cup continues to be a major summer showcase for youth soccer. For two weekends in July, the San Diego Polo Club in Del Mar was filled with soccer players from across America (and Europe) who competed in this invitation-only tournament where U.S. Women's Superstars Rachel Buehler, Alex Morgan, and Hope Solo all have played. With only a week or two of official practices under their belts some Blues teams headed down to San Diego on both weekends to compete in one of Southern California's major tournaments. During the summer tournament season the Surf Cup is not the only show in town. All of our Blues teams will be busy on weekends either traveling or playing on the fields of Southern California including the Labor Day Weekend where we will host our own Blues Cup. Good luck girls! Did you see it? The FIFA Women's World Cup began on June 26 in Germany with the Final on July 17. For more information about the tournament or Women's International Soccer history click the logo on your left. Coach Bobak is quoted as saying "the best coach in the world besides Larry is watching high level games then going out and playing on your own". The games were televised so hopefully the girls had a chance to watch a few of them including the exciting tournament final between the United States and Japan. As you no doubt know by now Japan became the World Champs defeating the U.S. in penalty kicks. On another note you may be asking yourself if any Blues players took part in the FIFA Women's World Cup? As a matter of fact, yes! But although the Blues have several players in the Youth National Team program, unfortunately we didn't have any alumni on the Full U.S. Women's Team. Rob Rennie will be happy to know, however, that one of our alumni was part of England's National Team. Goalkeeper Karen Bardsley (2002) who played at local Cal State Fullerton and currently plays professionally for Sky Blue in the Women's Professional Soccer League was one of England's goalkeepers. Congratulations Karen and good luck! Hopefully we can get you to come back to Rancho Capistrano to tell us about your experience. SAN FRANCISCO, CA - Two goals and two assists, coupled with her consistent delivery of hard work earned Western New York Flash Forward/Midfielder McCall Zerboni the majority share of votes, and the honor of being named Women's Professional Soccer's Player of the Month for May. The Flash's 5-0 record in May can be largely attributed to the tireless work of Zerboni, who appeared in all five May games for the Flash, while logging a total of 353 minutes on the field. The San Clemente, CA native earned top honors in Week 6 as the Player of the Week after notching an assist and two goals, including the game-winner in the Flash's 3-2 victory over the Boston Breakers on Friday, May 13. She assisted the equalizer in the Flash's May 29th match against the Philadelphia Independence, and her hard work in this game turned out to be the difference when she was clipped, while dribbling through Philly's 18 yard box, which set up the game wining PK. Zerboni's achievement marks the first time in franchise history a Flash player is honored as the Player of the Month. The veteran midfielder/forward has been a player in WPS since 2009, when she played for the Los Angeles Sol team that captured the inaugural season championship. She spent the 2010 with the Atlanta Beat, and joined Western New York as a free-agent during the 2010-11 off-season. 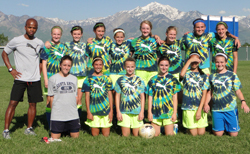 Our club had an impressive showing at this year's Far West Regional Tournament in Boise Idaho. Out of the five Blues teams to qualify for regional play (U14, U15, U17, U18, U19), as competition would have it only Dido's U17 team was able to punch a ticket to the US Youth National Champions in Phoenix, Arizona. Still we should take pride in the fact that all of our Blues teams were great representatives of our club. 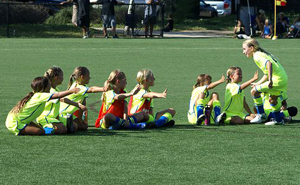 Each of our teams came out of their groups with the U14's getting eliminated in the quarterfinals. Our U18 and U19 Blues both got tripped up in the semifinals, and the U15 Blues came oh so close to joining the 17's in Phoenix. It was not to be, however, as they were defeated in the finals 2-1. Nevertheless there was plenty of Lime and Blue in Boise this year. The tournament took place June 20 through 26 and featured some of the top teams in Region IV (West). Thanks to everyone for the support and the comments you posted on our So Cal Blues Facebook page. We think next year's Regionals will be held in Hawaii...hmm. 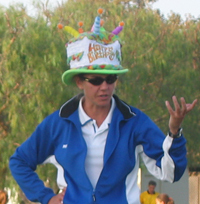 The final whistle had been blown; So Cal Blues 2 – Rio Vista FC 0. For the second time in three years we had won the Far West Regional Tournament. We were all excited and finally had a feeling of pride and success; for our journey was long and the work was hard. Throughout our journey there were emotional highs and lows. The strength of our team has always been our work ethic; the commitment to one another and our ability to pick each other up no matter the situation. From the time we earned the right to attend regionals having won the Fall FW Regional League in pouring Temecula rain, our focus has been on the regional championship and advancing to Nationals. Our training has focused on fitness, mental toughness, and specialized skills. I can honestly say there were times when we as a team did not always understand the reasoning for drills we took part in and we definitely didn’t enjoy the words “GET ON THE LINE!” During those difficult times we had to put our trust and faith into our coach Dido! As the countdown to Boise got closer our excitement level rose and nerves were coursing through our bodies. Our first match was against Full Force FC of Alaska and we won 8-0. We stayed focused, however, with the knowledge the competition ahead would be much more difficult. We finished first in pool play which gave us a feeling of accomplishment. Still after three games we were only half way there and we were exhausted. We poured every ounce of energy into each pool game and with limited substitutions. Under regional rules once a player is substituted she may not reenter the game in that half. We only had between two and three subs and to win this regional tournament we would have to play six games in one week! Fortunately we were given one day of rest after pool play but we were up bright and early for an 8:00 am kick-off both Friday and Saturday for the Quarter and Semi finals, respectively. Without taking any team lightly we understood our toughest opponent would be Crossfire Premier from Washington on Friday morning. We were down a goal at half time and the feeling of possibly losing the game and giving up our senior defender Mikhaila Bowden was not settling well with any of us. We went back out there and played our game scoring a goal to tie it up. We then went into two fifteen minute overtime periods and at that moment we decided we were only going home as winners. We scored a goal in the first overtime and fought them off until the game had ended. Saturday's game too had a rough start going down a goal, but we came roaring back to tie then eventually to win 3-1. All of our goals that week had been quality; both build up and finish. That said, Danielle Spriggs’ strike during Saturday’s semifinal was my favorite. Following a combination from the defense Megan Crosson got the ball to Spriggs out wide where she beat three defenders then cut to the center to finish from just outside the penalty area. It was a marvelous shot and goal that put us in command of the game. So there we were Sunday morning about to play Rio Vista FC for the second time in a week; this time for the Regional Championship and the right to represent Region IV at the National Championships in Phoenix, Arizona. Now that we were in the finals along with the fact our flight time had been moved up, we knew we would have to wait until Tuesday before we could get a flight home. With the news of our flight being changed at first we were bummed. Then we realized that this gave us all even more focus and desire to be Regional Champs! There was no way we wanted to be stuck in Boise an extra two days both sad and disappointed! Although we were exhausted it didn’t matter this day. We knew exactly what had to be done. At half time it was still 0-0 but the second half we put everything on the line and took all of coach Dido’s advice. Maddie Krauser scored our first goal and our confidence was instantly boosted. Not too much later Jen Stanley shot a rocket from about the mid line to give us a 2-0 lead. Our defense had done a great job the entire week and this continued into the final. Our amazing keeper Sammy Jo Prud'Homme came up with several big saves including one on a penalty kick in the first half. This was the second time she saved a pk where we would have gone down but instead she came up big. That final whistle sounded, the week was over, and we were the champs! Looking back on all of our preparation we realized that everything Dido had been teaching us and making us do was tremendously helpful in our games. All our work had paid off and the feeling we had was like no other. Our team was so happy and spent the next two days in Boise, Idaho enjoying the time we spent together. Win Nationals: Lets do this! My team coached by Randy Dodge. I suppose I should give him props for binding the cracks in our team and uniting us to become unstoppable. Thank you Randy! On the other side of the field was West Coast, an outstanding team with great talent. The question that was still up in the air until the final whistle blew was not so much who was the better team, but who wanted it more. For both teams, it was a tremendous battle. Bodies were flying across the field just to get that extra touch that may have led to another goal. West Coast came out strong with determination and scored the first goal on a breakaway. Despite the 1-0 lead by West Coast, my team did not give up. Right outside the box, one of my teammates got fouled. Standing behind the ball I bent (spin-hooked) the ball into the box. The ball suddenly popped out and Miranda Shultz used her knee to play the ball in over the goalie’s head. At half the score was 1-1. The next 35 minutes was a full out draw. Both teams were attacking with pride but no team could seem to break through. The final whistle blew, but the game was still tied. The center ref announced we would now play overtime with no golden goal. Once again, the first overtime was pretty even. However, the second overtime period was a different story. Off the second ball, I quickly collected it and played it to Miranda. Miranda then gave a beautiful ball to Erika Okuma who took a good touch that beat both the defender and goalie. GOAL! The crowd went crazy and my teammates and I were screaming. A couple minutes later the referee blew the final whistle. Game over! Blues crowned State Champions over West Coast 2-1. We had won National Cup for the first time. However, this meant more than the State Championship; our team had now earned the right to attend the Regional tournament in Boise, Idaho. The second we were told at practice, we were psyched. We were going to Utah to represent our state and the So Cal Blues in the Far West Regional's President Cup as a wildcard. Our coach, Ben trained us hard and before we knew it, it was time to step on the plane headed to West Jordan, Utah. When it was time for the first game, the nerves were going crazy, our team had no idea what to expect once that whistle blew. 1....2...3.. BLUES; and our marathon has begun. We came out of the first game with a 10-0 win over Oregon. The team felt super good as we continued to win, gaining confidence that we could be the winners of this tournament. Our team got through pool play with an awesome shut-out! The quarter-finals were here and we fought it out 'til beating a determined Washington team, 2 to 0! Off to the semis! We could all say the semis were probably the most nerve-wrecking of all. We were used to the games, the field, the altitude, the way the teams play, and we were all ready to get our game on! In the Semi- Final game we all were fighting so hard, the game could go any way, and in the last 8 minutes, the opponent scored. We all tried so hard to tie it up so we had at least a chance to make it to the finals. But, the Washington team went away with the win. SC Blues Helm was heading home. Our team walked off the field with our heads held high knowing we left everything on the field. This journey we all got to experience together was absolutely incredible! We all got to bond as a team. From the team team breakfasts, team dinners, team talks to yoga time and the park city alpine rides, we all had an experience that will last us forever. Coach Ben did a fantastic job keeping us all together all the time and always preparing us for what's next. Even if it was making us eat GU Packets or Energy Gum, we appreciate everything he did for us. Hopefully we will get more chances like this in the future, to bond even more and next time champions! GO BLUES!!! Over the past weekend the Blues U14 Helm traveled to Phoenix, Arizona to represent the So Cal Blues in a Far West Regional League match against SC Banat. Despite a SCDSL match on Saturday, travel, a hot and humid Phoenix Sunday morning, the girls battled for the entire game until Lauren Romano's precise crossing pass was finished by Logan Doyle for the much celebrated 1-0 game winner. Following the game a few of the girls traveled to the campus of the Arizona State University Sun Devils to catch the second half of their game against the University of Washington Huskies. In an almost carbon copy of our Far West Regional game, late in a competitive second half the Sun Devils found the game winning goal much to the delight of the home crowd. After the game, the girls ventured onto the field to meet, visit, and get a picture with former SC Blues standout and senior at Arizona State Kari Shane; who unfortunately did not play due to a concussion suffered against UCLA. Kari was a gracious host and great role model to our young players and expressed a desire to be a Blues coach in 2012.